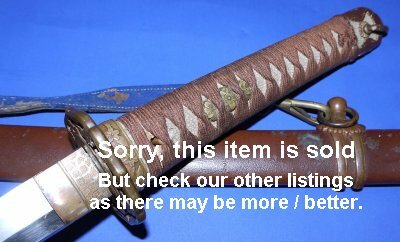 In good condition, a WW2 Japanese Army Officer's Gendaito Shin Gunto Niwa Kanehisa. Signed Niwa Kanehisa (real name Niwa Kihachi), a Rikugun Jumei Tosho certified gendaito swordsmith, born 6th December 1908, died 1st January 1989, younger brother of Murayama Kanetoshi. A silver mon to the kabuto-gane (pommel). 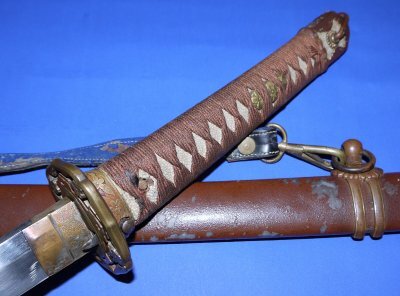 Niwa Kanehisa was not a prolific WW2 swordsmith by any means and his blades are rare. The 24 3/8 inch nagasa (cutting edge section) blade is in very good condition, good original polish, some scuffing to shinogi (blade ridge), some scratches, absolutely no ware or flaws. The tsuka is a little loose on the blade (it could use another seppa / washer to bring it flush into line with the mekugi-ana closest to the tsuba). Overall the fittings are good with the added bonus of a family mon and strap which both indicate this gunto was taken off the Japanese officer (that it is not a mass surrender item). The locking pin works but does not hold because the thin saya / scabbard metal strip has gone. A very well made blade in a great gunto. Nice investment: £? (too late, now sold). Please quote item reference AE18 (0676). Further / full sized images available upon request.